I happen to love the Spanish subjunctive. I love how expressive this mood can be. I love how the present and past subjunctives incorporate all the irregulars of the present and preterite indicative. And I love the two forms of the imperfect subjunctive. IMHO the question of when to use the indicative versus the subjunctive is TONS easier than the question of when to use the preterite versus the imperfect. I tell my students that once they learn the rules, they will be okay. Of course, my students don’t necessarily buy into my enthusiasm…But I keep trying. This year I’m experimenting with a new approach whereby I characterize indicative contexts generally as fuerte ‘strong’ and subjunctive contexts generally as débil ‘weak.’ This is actually a student-friendly version of the linguistic terminology of assertions versus non-assertions that I picked up when researching Question 87 of my book (“How can the subjunctive be used for actual events?”). Of course I also teach my students specific uses of the subjunctive, often including the WEIRDO acronym. (Maybe one day I will try Lightspeed Spanish’s WOOPA acronym also or instead.) But I believe that it is helpful to give students an overall concept as well as the specific cases. In class, I handed each pair of students a list of the eleven numbered sentences from the PowerPoint. (See below, where I’ve underlined the correct answers.) As I showed each slide, the student pairs tried to figure out whether the situation fit the indicative or the subjunctive. Then I called on one pair to report and explain their decision. The students really seemed to enjoy the activity, and mostly came up with the correct answers. 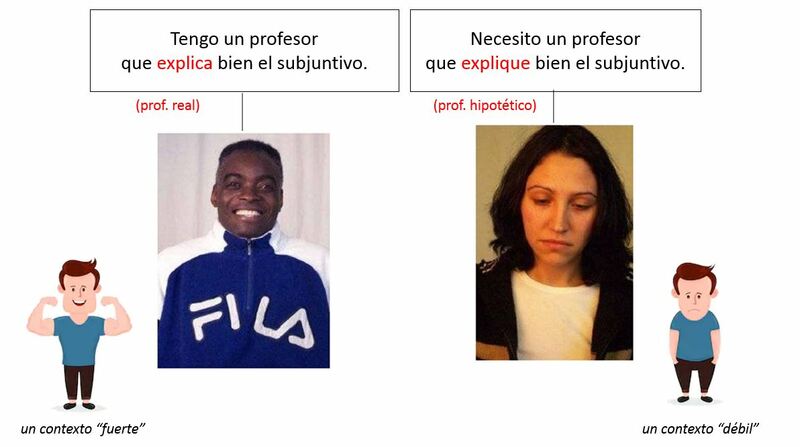 ¿Indicativo (real) o subjuntivo (hipotético)? Estoy buscando a un profesor que enseña/enseñe portugués. ¿Conoces un restaurante que tiene/tenga comida barata? ¿Conoces a una chica de Egipto que vive/viva en mi colegio mayor? Quiero leer un libro que se llama/llame Tool of War. Quiero trabajar con una persona que tiene/tenga mucha experiencia. Estoy buscando un libro que me enseña/enseñe a reparar mi bicicleta. Quiero leer un libro que me explica/explique la gramática. This entry was posted in Verbs and tagged indicative, relative clauses, Spanish, subjunctive on 26 October, 2018 by jhochberg. Last week, several students in my intermediate Spanish class crashed and burned on what looked to me like a routine homework assignment. The topic was the subjunctive in contexts of doubt and possibility, and the format was constructing sentences “Chinese menu” style, with one element from each column. I wasn’t wild about this activity. I would have liked to have seen more variety of subjects instead of just yo…yo…yo. Also, the activity included only one unambiguous indicative context (creo que). At the same time, it reinforced a clunky simplification that our textbook makes in introducing this topic. While in real life quizá(s) and tal vez can be followed by either the indicative or the subjunctive — this is, indeed, one of my favorite demonstrations of the power of the subjunctive — the textbook presents them as always triggering the subjunctive. I’d rather postpone quizá(s) and tal vez until students are ready to handle, and even enjoy, this flexibility. These misgivings aside, I was surprised by the fact that many of my best students kept the indicative (podré, me tomaré, encontraré, etc.) in all of their sentences. A class discussion revealed why: they were following the rule of thumb, drilled into them in high school classes, that the subjunctive is only found in sentences with a change of subject signaled by que. Whereas English uses the infinitive ‘to leave’ in both sentences, Spanish uses the infinitive only if the two clauses have the same subject. 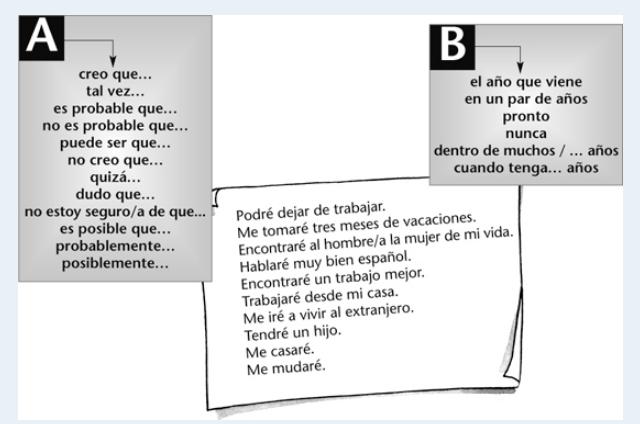 Sentences like the second one above, which has two different subjects (yo ‘I’ and tú ‘you’) separated by que, require the subjunctive. A rule of thumb, however, is different from an actual rule. Expressions of doubt require que and the subjunctive even when there is no change of subject: for example, Dudo que tenga un hijo el año que viene ‘I doubt I’ll have a kid next year’, to use one of the “Chinese menu” options. While the ‘rule of thumb’ suggests the use of the infinitive instead, the resulting sentence Dudo tener un hijo el año que viene sounds less natural than the subjunctive version. My students’ difficulty on this topic reflects the overall danger of relying on rules of thumb, including mnemonics, in teaching and learning. I’ve seen the same problem crop up in students’ reluctance to use the preterite to talk about weather (e.g. Ayer llovió ‘It rained yesterday), because somewhere along the line they learned to always use the imperfect. For more on this general pedagogical topic, please see this post from 2013. Finally, I must include a shout-out to this discussion, which I found helpful in answering my students’ questions about this topic, and which more or less inspired this post. 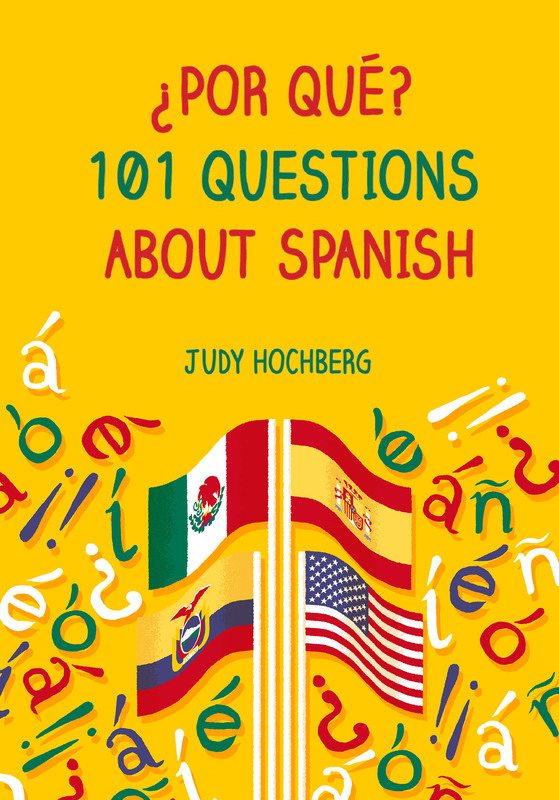 This entry was posted in Verbs and tagged doubt, probability, Spanish, subjunctive, subjunctive v. indicative on 8 October, 2018 by jhochberg. I thought there was nothing left for me to learn about Spanish stress, a topic that encompasses both pronunciation — which syllable in a word is given the greatest acoustic prominence — and writing — the use of accent marks to indicate irregular stress (inter alia). After all, I wrote my dissertation about how children learn the relevant pronunciation rules, then spun off two papers on this topic (here and here). More recently I devoted one question in my book to spoken stress, and one to accent marks. And accent marks are always a favorite topic for me to teach, both to students and to native speakers, who are uniformly delighted to learn how systematic this part of Spanish orthography is. My top recommendation for an online summary, with some nifty exercises, is here. So it was surprising when a conversation with a student made me question, in a small way, my understanding of this topic. I had been going over the stress rules with this student, including the basic rule that words that end in a vowel are stressed on the next-to-last syllable. (Think HEcho, partiCIpa, todopodeROso, and desafortunadaMENte.) She then asked if porque ‘because’ was an exception to this rule. This question threw me for a loop. Porque is related both to the interrogative ¿por qué? ‘why?’ and the noun porqué, which also means ‘why’, as in el porqué de una decisión ‘the why of a decision’. These two words/phrases both stress the qué, and the student assumed that porque did as well. When I said porque out loud, at first I thought I stressed the que. But the more I repeated the word, the less certain I became of my own stress placement — a kind of Heisenberg effect. Fortunately, we live in a time that is rich in language resources. I was able to pull up wordreference’s listing for porque, which includes recordings of Mexican, Spanish, and Argentinian pronunciations. These pronunciations are divided: the Mexican pronunciation stresses the que, but the other two clearly stress the por. I then checked on Forvo, a crowd-sourced pronunciation dictionary. Again, the Mexican pronunciations stress the que, and the others — from Spain, the DR, and Argentina — stress the por. However, some examples provided of porque in context — for example, this one, recorded by a speaker from Spain — are more Mexican-style. So the correct answer to my student’s question seems to be that in general, porque follows the rules of Spanish stress, but not in Mexico, and not always in Spain, either. This entry was posted in Sounds and tagged accent marks, penultimate stress, por que, porque, Spanish, stress, word stress on 5 October, 2018 by jhochberg.